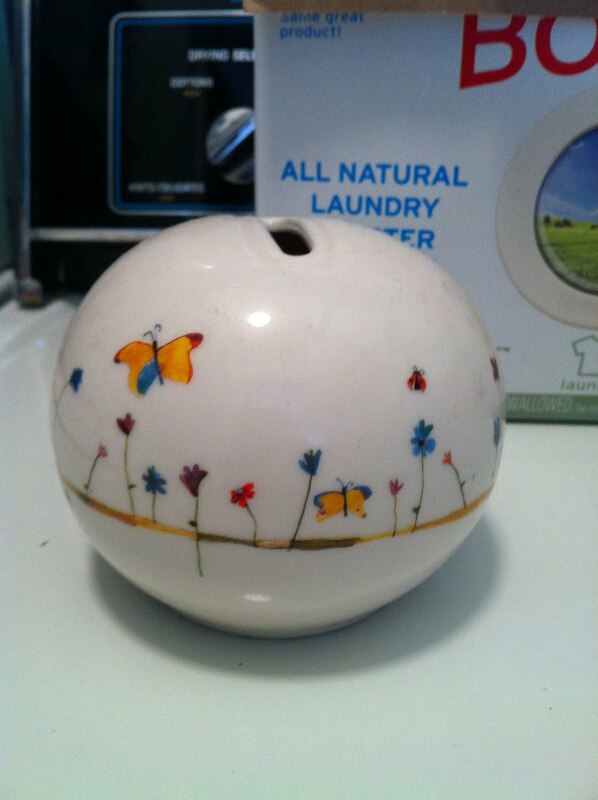 When we moved into our little castle on 9th street four years ago, I placed a little piggy bank in the laundry room. Since then, I've done more than just a little laundry but along the way, I have collected coins that have been forgotten in pockets and deposited them into my bank - thinking that I'd use this money to reward myself for a job well done. Today, approximately four years since making my first deposit, I decided to empty my bank to see what I had earned. I momentarily flashed back to all the stained onesies, dirty sheets, dirty underwear, stained T-shirts and all of the other things that I'd laundered over the past four years and readied myself for my reward. Yeah, um, five whole big ones. So, that's been like what? A $1.45 a year? Three cents a week? See ya later family. Thanks for the good times but I've got myself a better paying gig in a sweat shop. Haha! Nice! Thanks for stopping by my blog and commenting! I love yours, and am now following!